The breakout star is representing Black girl nerds everywhere. You may not know the name Storm Reid right now, but by March 10—the day after her $100 million Disney film, A Wrinkle in Time hits theaters—you will. The 14-year-old actress is brilliant in her role as Meg Murray in the updated film adaptation of the classic book about a young girl whose father has disappeared into another dimension. Before you start the comparisons, A Wrinkle in Time is not just another Disney movie. This film is an event, and Reid is a huge reason why. The Atlanta native’s portrayal gives a new generation (and even the older ones) an example of a sci-fi Black-Girl-Magic hero, something we’ve never really seen before now. The film’s significance is more than a defining moment; it’s a redefining moment for all generations of Black and Brown girl nerds who never saw kids who looked like them as heroes in Sci-Fi blockbusters. Co-star Mindy Kaling echoed that sentiment. In that way, being a part of A Wrinkle in Time was healing for Kaling. “I finally feel welcomed with open arms to something that has ignored me completely. That is so profound. [This is] something that the miniature version of me could watch and be excited by,” she said. Of course, representation matters, but that alone is not enough. For A Wrinkle in Time to truly mark a cultural moment, it has to have a great story with an amazing, child star. 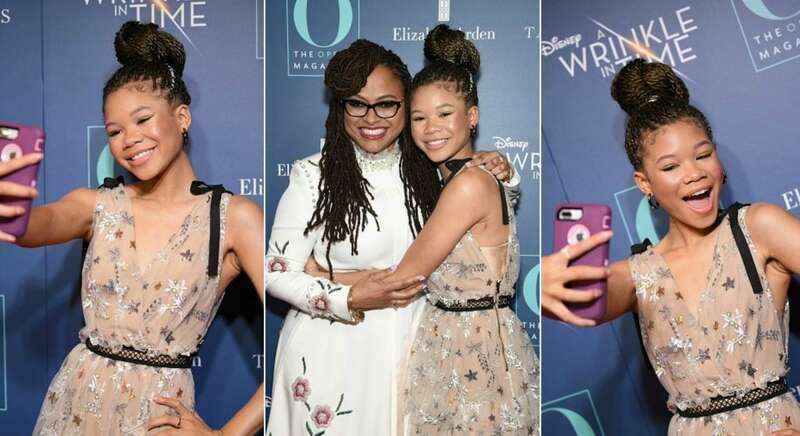 Enter Storm Reid, whose talent DuVernay recognized the moment she auditioned. It was “the biggest gift,” she said of the moment she found out Reid was free to do the film. Audiences around the world will soon understand why. Even when standing next to the indubitable, Oprah Winfrey, Reid owns the screen. There are scenes where Reid is able to display the entirety of her character’s complex mix of pain, betrayal, abandonment and anger all within her expressive eyes. And when Meg and her friend Calvin (Levi Miller) are in a bind, she uses physics to calculate how to save them both, leaving Calvin and everyone else, who will fall in love with this character, in complete awe. When the credits roll and you hear the melodic voice of Sade singing, “Flower of the Universe,” (her first new song in eight years), you will know you’ve witnessed something special—a little Black girl coming into her destiny. Greatness can be a hard, lonely road—especially for a child, and most especially in Hollywood. Fortunately, Reid has the support of her family and the protection of two profound mentors in DuVernay and Winfrey. “This girl has been raised well,” said Winfrey, clutching Reid’s left hand in both of her own. 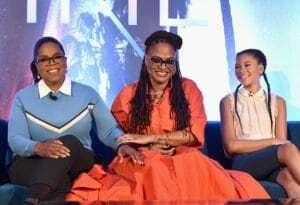 Winfrey praised Reid’s parents, especially her mother, who was on set every day of production, before recounting the story of the “beautiful” experience of seeing Reid watch herself in A Wrinkle in Time for the first time. Like the rest of the cast, Reid felt very proud of the film, but would later voice some concerns about how people would react to seeing her success. “Do you remember what I told you about fame?” Winfrey asked, turning to Reid who gave the biggest smile before answering.